government of India considered ‘disturbed’ areas. 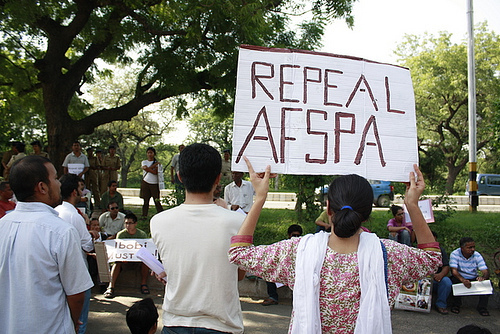 AFSPA was passed on 11 September 1958 and applied to the Seven Sister States in India's northeast. Another Act was passed in 1983 and applied to Punjab and Chandigarh and was withdrawn in 1997, roughly 14 years after it came to force & from Tripura in 2015. Another such act was passed in 1990 and applied to Jammu and Kashmir. 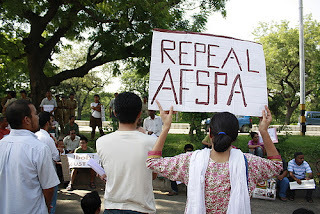 Presently, AFSPA is enforced in Assam, Nagaland, Manipur (except the Imphal municipal area), Arunachal Pradesh (only the Tirap, Changlang and Longding districts plus a 20-km belt bordering Assam), Meghalaya (confined to a 20-km belt bordering Assam) and Jammu and Kashmir. Powers to declare areas to be disturbed areas – As per section 3 of the AFSPA 1958 if the Governor of the State or the administrator of the Union Territory or the Central Government, in either case, if of the opinion that the whole or any part of such State or Union territory, as the case may be, is in such a disturbed or dangerous condition that the use of armed forces in aid of the civil power is necessary, the Governor of that State or the Administrator of that Union Territory or the Central Government, as the case may be, may by notification in the Official Gazette, declare the whole or such part of such State or Union territory to be a disturbed area. (d) enter and search without warrant any premises to make any such arrest as aforesaid or to recover any person believed to be wrongfully restrained or confined or any property reasonably suspected to be stolen property or any arms, ammunition or explosive substances believed to be unlawfully kept in such premises, and may for that purpose use such force as may be necessary. ii. Destroy any arms dump, hide-outs, prepared or fortified position or shelter or training camp from which armed attacks are made by the armed volunteers or armed gangs or absconders wanted for any offence. iii. To arrest without a warrant anyone who has committed cognizable offences or is reasonably suspected of having done so and may use force if needed for the arrest. iv. To enter and search any premise in order to make such arrests, or to recover any person wrongfully restrained or any arms, ammunition or explosive substances and seize it. v. Stop and search any vehicle or vessel reasonably suspected to be carrying such person or weapons. vi. Any person arrested and taken into custody under this Act shall be made present over to the officer in charge of the nearest police station with least possible delay, together with a report of the circumstances occasioning the arrest. vii. Army officers have legal immunity for their actions. There can be no prosecution, suit or any other legal proceeding against anyone acting under that law. Nor is the government's judgment on why an area is found to be disturbed subject to judicial review. viii. Protection of persons acting in good faith under this Act from prosecution, suit or other legal proceedings, except with the sanction of the Central Government, in exercise of the powers conferred by this Act.